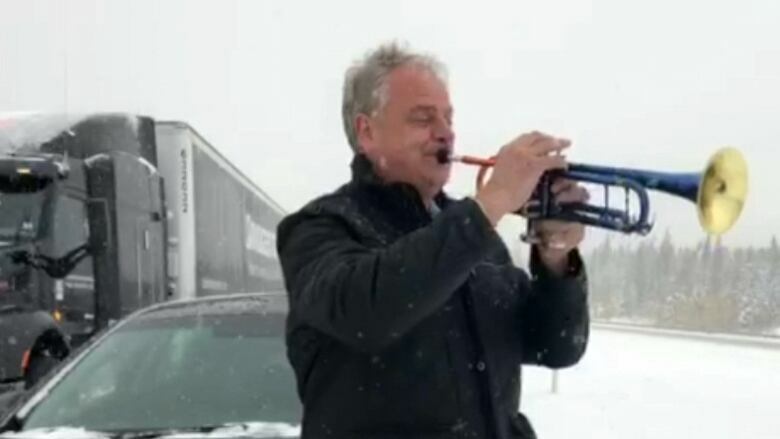 Alberta trumpet soloist Jens Lindemann captured the world's attention last month when he serenaded motorists stranded for more than 10 hours on an icy stretch of the Trans-Canada Highway. The performance netted the acclaimed musician (he's the first classical brass player ever to receive the Order of Canada) an opportunity to play the national anthem at Madison Square Gardens. And now, he's turning the limelight toward other Canadians' accomplishments with a new recording that celebrates three iconic Albertans. "We really need to get better at celebrating our own people," Lindemann told Russell Bowers on CBC's Daybreak Alberta. "We are not naturally gifted as Canadians to say, 'we have our own heroes here.' We're more subtle." The songs pay homage to former senator Tommy Banks, diplomat Ken Taylor who harbored six Americans during the 1979 Iran hostage crisis and former premier Peter Lougheed. Lindemann said he was close personal friends with Banks and Taylor and went to high school with one of Lougheed's sons. "All three of those pieces are dedicated to them and their particular legacies. There are musical motifs based on their lives and how they were important to Albertan and Canadian society as well as people all around the world." He said the pieces highlight a particularly Albertan facet of the men's identities — their maverick, can-do spirits. "We have a can-do spirit. In the case of all three of those individuals, they marked their turf by being outliers of sorts," he said. A digital album of the three pieces is available on Lindemann's website, and you can hear a preview of the songs as well as Lindemann's interview below. With files from Daybreak Alberta.